Its not only the first time tourist to Bangkok that may find it a little daunting when trying to figure out the most efficient and economic way of getting from the airport into downtown Bangkok. In this series, we will examine the different options that are available for getting from the airport to downtown, and we will set out the benefits and pitfalls of each option. 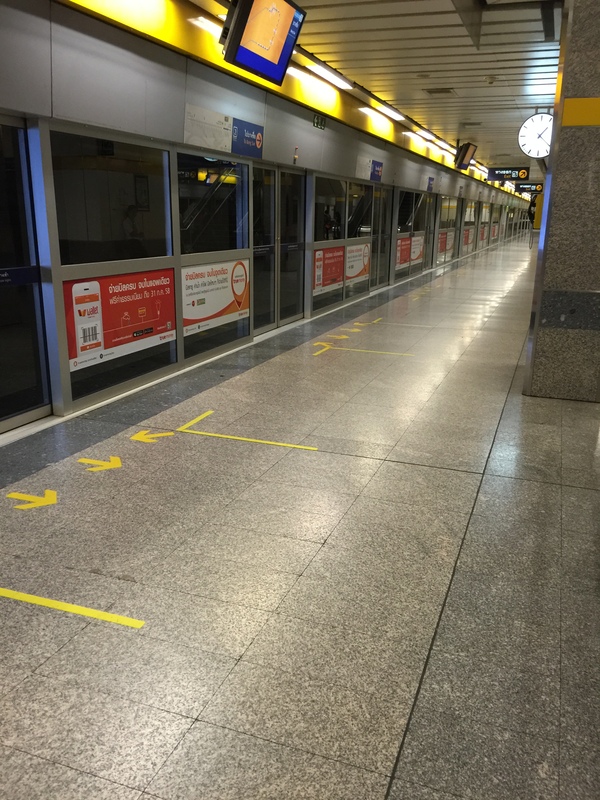 Today’s blog will look at the light rail option, the Suwarnabhumi Airport Rail Link. Gateway to Bangkok – Don Muang or Suwarnabhumi airport? When arriving in Bangkok by air, there are two different airports that service the city. The original is Don Muang (IATA code DMK), which is on the northern border of Bangkok. This is the airport that American GIs during the Vietnam War in the 1960s would have used when going on R&R in Bangkok. It has undergone quite a bit of refurbishment and upgrades since then, but the international terminal has a very dated feel, and it is currently being used by budget airlines such as Air Asia, Scoop/Nok Air and Lion Air. Unless you want to experience some 60s nostalgia, we recommend you avoid landing at Don Muang if you can. A lot of the charter flights from Russia/Ukraine and China land here, and as a result, the arrivals immigration area can sometimes be really jam packed. Recently, immigration processing often took between two and four hours (i.e. just waiting in line) due to huge numbers of simultaneous arrivals. The worst times tend to be around 9pm to 2am, when immigration manning decreases, but flight arrivals increase. Note, in recent press releases, immigration have vowed to decrease wait times, but… well, you have been warned. The other issue with Don Muang is it tends to be more expensive to get into Bangkok with fewer options. The other, newer airport, which opened in late 2006 is Suwarnabhumi (IATA code BKK), located in Samut Prakan province, just east of the Bangkok border. This airport is conveniently situated right along the Bangkok to Chonburi/Rayong motorway (one of the best motorways for getting into Bangkok). This airport has much better facilities compared to Don Muang and is serviced by most major (non-budget) airlines. Immigration times are significantly shorter than Don Muang and the queuing system is better organised (so less chance of queue jumpers, and it is clearer as to which line you should be standing in). Suwarnabhumi also has a a rail link into the city as well as more bus and shuttle services. Our favourite option for getting quickly to downtown Bangkok is to take the Suwarnabhumi Airport Rail Link (abbreviated to SARL or sometimes SRTET). This option is currently only available from Suwarnabhumi airport (although a rail link is currently under construction for Don Muang, which should be completed sometime in 2018). This link heads due West from the airport, into the centre of Bangkok, following parallel with roads such as Rama IX, Petchaburi, Sukhumvit / Ploenchit and Phattanakarn Rd, heading all the way to Phayathai Road in central Bangkok. The Suwarnabhumi to Phayathai route consists of eight stations in total. The final station of the SARL is Phayathai, which puts you very close to Victory Monument in Bangkok. Victory Monument is a good spot for getting transport to China Town/Khao Sarn Road (for all you backpackers). Phayathai Station also interfaces with Bangkok’s original skytrain system, the BTS (Bangkok Transit System), which will get you to the newer parts of Bangkok such as Ploenchit Rd, Sukhumvit Rd and Silom Rd. If you need to transfer onto Bangkok’s subway, the MRT (Mass Rail Transport), then get off two stations earlier at Makkasan Station instead of Phayathai. The MRT is useful if you wanted to get to either northern Bangkok (e.g. the weekend market, Asoke Road, or to the main Bangkok train station (Hualamphong) on the edge of China Town. The cost to take the SARL is baht 45 for the full length, and is less for shorter journeys. There is sometimes reference to an express train service, but this was suspended a few years ago (if it ever does return, the price is likely to be a flat rate of baht 150). To catch the rail link, from the main arrivals hall, look for the escalator (or elevators) heading down. Get off at the basement level. Tickets can be purchased either at the official kiosks (attached to the gates) or else via the ticket machines. The bank just before the rail terminal in the basement is one of the better options for changing money within the airport. The banks and exchange counters on the arrivals level tend to give worse exchange rates. This is probably the fastest option for getting into the centre of Bangkok from the airport. It is also the cheapest option. The trains include luggage racks where you can stow your suitcases, so they are passenger friendly, and given you are getting on at the first station, you should be able to get a seat rather than have to stand. Travel by public transport when you have lots of baggage is probably not for everyone. Even though the SARL has baggage stowage options, once you transfer to some other form of public transport (e.g. BTS or MRT) those options do not have baggage stowage compartments, and can get very cramped on weekdays (and I wouldn’t even contemplate it at rush hour). Another downside is if you are staying in locations not easily accessible to any of the mass transit options, for example in China Town, Dusit, on Khao Sarn Road or Soi Rambutri. In those situations, there will be alternative cheap transport options to get you significantly closer to your hotel. Also, if you are planning on walking down busy side streets with suitcases, keep in mind that Bangkok sidewalks are not great, and on side streets often non-existent. This means you will be walking along the road with motorbikes, cars, trucks, tuk tuks, angry dogs etc. One tip to overcome this is to spend the initial baht 45 to get you as close to your destination as possible, and then from there grab a taxi for the final leg. You generally need to grab a cab travelling along the main road rather than one that is parked up at the base of an SARL station as the latter often don’t want to use their meter. The final downside is there is no rail option from Don Muang (yet), so if you are arriving at this airport, you will need to look for other options. We will cover some of these in the next part of this series.